Aquascaping contests are a big deal. The biggest is the annual International Aquatic Plant Layout Contest (IAPLC) organised by Takashi Amano’s company, Aqua Design Amano. With a top prize of around $8,000, it’s no wonder it’s taken seriously by thousands of aquascapers worldwide. However, the biggest motivation for many is the accolade of being Grand Champion and arguably regarded the best aquascaper in the world. The other reasons for entering aquascaping contests can vary. Some aquascapers are competitive and like to know how they rank in relation to their peers. Others like to have a goal to aim for. Personally, I like to see an aquascaping contest as the final part of the aquascaping process–like a form of closure. Once it is submitted, it’s time to move on to the next creation and try to improve, using lessons learned from the previous incarnation. I have judged numerous aquascaping contests and have been invited onto the panel of two international contests later this year. I am also a passionate aquascaper myself and try to enter both the IAPLC and Aquatic Gardeners Association (AGA) International Contest every year. I wanted to share with you some of the processes I go through to get ready for that all-important final photo shoot of the aquascape. 1. Ensure your plants are in peak condition. Stem plants are usually trimmed a week or so prior to ensure they look as full and healthy as possible. Other plant preparation can include deliberately overdosing with fertilisers and adding extra light in combination with large, frequent water changes. 2. Clean the glass thoroughly, including using an old toothbrush in the corners of the aquarium where algae can build on the silicon. Clean any excess algae from your rocks and/or wood. Follow that up with a large water change to remove any algae-laden aquarium water. This is usually done a few hours before the photo shoot. 3. Remove all in-tank equipment. The aquascape needs to have as little distraction as possible. 4. Consider back lighting. If you don’t have a background fitted to the rear glass, you can illuminate behind the aquarium to achieve an attractive background effect. Experiment with different lighting levels and coloured card attached to the wall behind the tank. 5. Consider using a hairdryer or another form of blower. 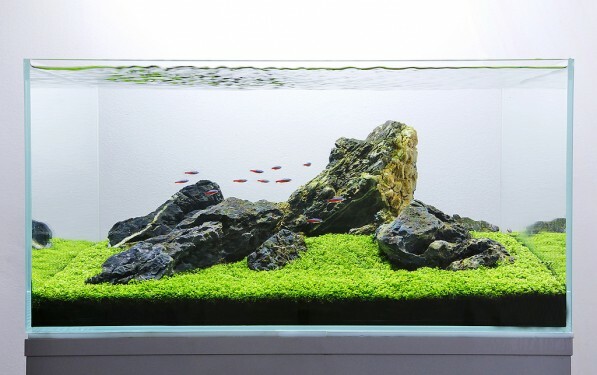 This can create amazing ripples on the water surface that add a real sense of movement to the aquascape photo. Exercise extreme caution when using any household electrical items near open water! 6. Wait for the fish to get into position. This may take some time and some gentle persuasion. I will often sit behind my camera (on a tripod) with a long broom handle and give it a gentle wave on either side of the tank. This can trigger the fish’s shoaling instinct, and if timed well enough, you can get a good shot. 7. Learn your camera settings and use a tripod. 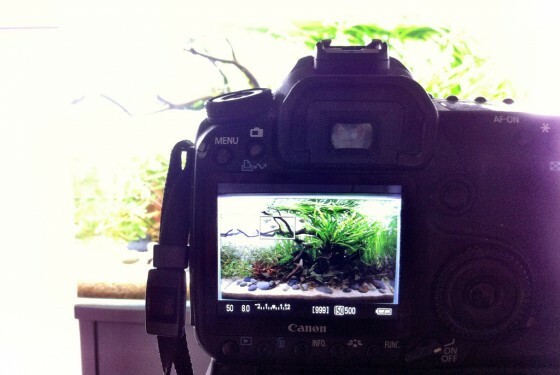 Aquarium photography is a separate blog (or several blogs!) in its own right, but in summary, get as much light above the tank as possible. Use a combination of a fast enough shutter speed to freeze fish movement, and small enough aperture to gain sufficient depth of field (front to rear in-focus). Use as low an ISO setting as possible too to get the best image quality. Ensure that the image fills the frame dead-centre and is perfectly level. Minimise reflections. 8. Take loads of photos and choose the best. Are you an experienced aquascaper that has entered lots of contests? Or are you a beginner getting ready for their first? Whatever your experience level, we’d love to hear from you. George Farmer is an internationally renowned professional aquascaper and planted aquarium expert from the UK. He contributes regularly to various international fishkeeping magazines and websites, and gives talks and demonstrations all over the world. George co-founded the UK Aquatic Plant Society in 2007 and is a member of the Aquatic Gardeners Association (AGA) where he was the keynote speaker at the 2015 AGA Convention in Washington DC.